BDS Suspension expands its FOX coilover lineup with new 6" DSC Coilover Systems for 2007-2016 Chevy and GMC 1/2-ton trucks and SUVs. These new systems bring all the features of the existing 6" performance coilover systems now with the added benefit of DSC (dual speed compression) adjustment. The adjustment knobs are built right into the remote reservoir allowing you to easily dial in the ride quality for optimal performance on any terrain. 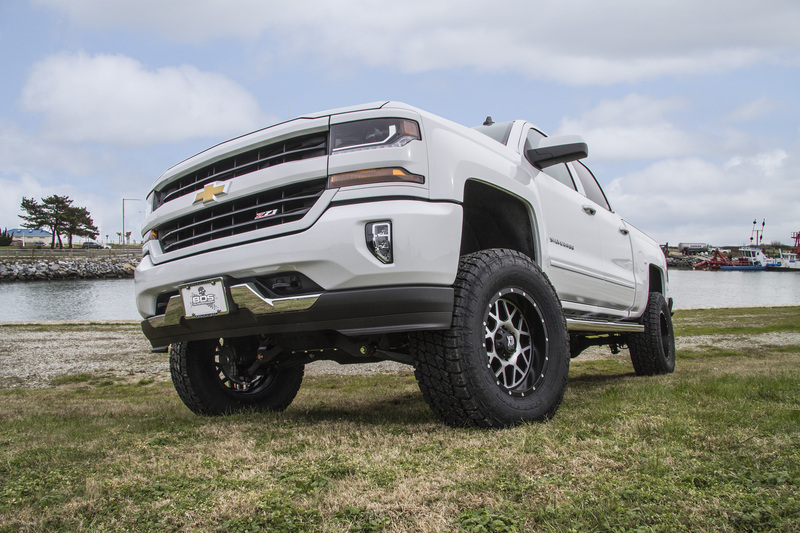 The new 6" FOX DSC coilovers are available both as an upgrade for current 6" equipped GM vehicles as well as complete systems to transform your stock vehicle to tackle the trail and urban jungle. 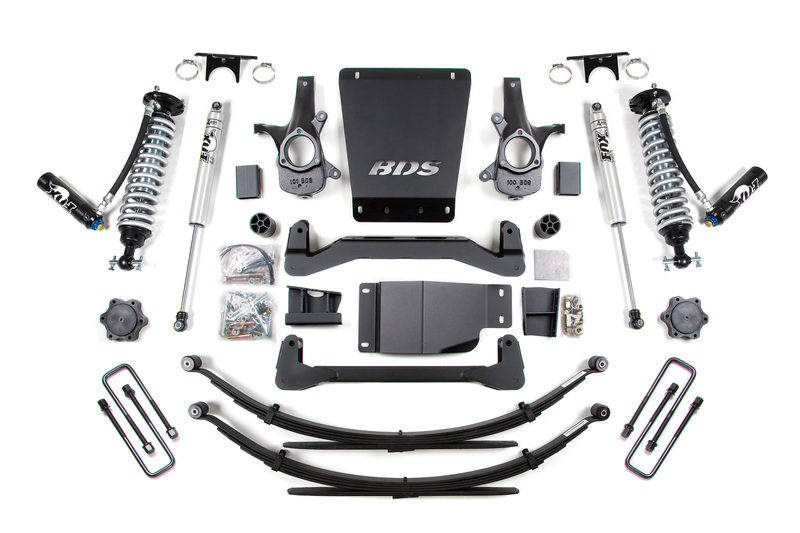 As with all BDS lift kits these new 6" DSC coilover systems are backed by Factory Protection Plus (FPP) offering peace of mind whether you’re on the road or off the beaten path. FPP combines BDS’s No Fine Print Lifetime Warranty, ESC system compatibility, and a 5-year 60,000-mile drivetrain warranty at no additional cost. 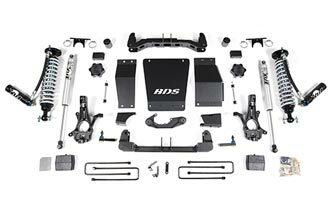 Get more out of your GM truck or SUV with BDS and FOX. 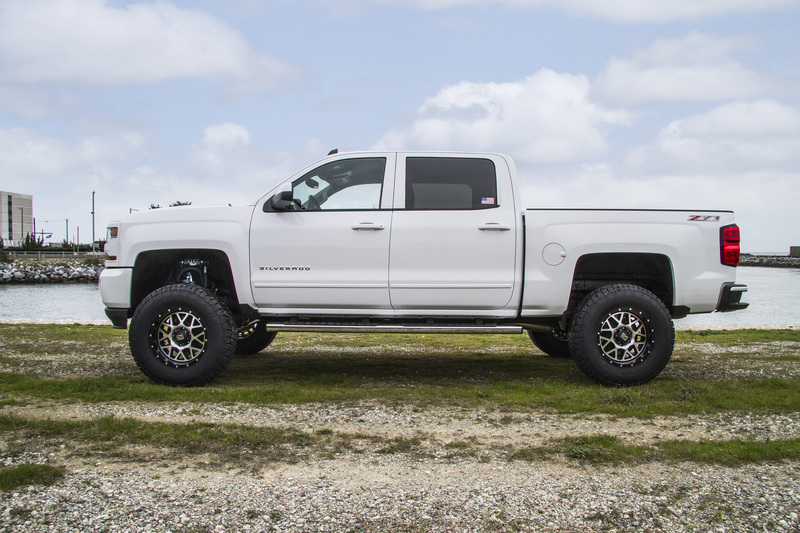 6" DSC Coilover Systems: BDS Suspension now offers 6" Performance Coilover Systems for the 2007-2016 GM 1500 trucks and SUVs. These new suspension systems utilize the tried and true high-clearance IFS design that has made BDS the preferred suspension lift for late model GM trucks. These systems are now available with precision tuned FOX 2.5" remote coilover with DSC adjustment to enhance the truck or SUVs performance on and off-road with the strength to stand up to any abuse you can throw at it. At the core of these new lift systems BDS supplies a pair of 1/4" steel high clearance crossmembers and differential skid plate to reposition the lower arms and add protection. These combined with the CNC machined ductile iron replacement steering knuckles creates a stout subframe to correct suspension and steering geometry for ESC system compatibility. Up front the 4WD kits use a multipoint differential relocation kit and CV spacers to securely reposition the front differential to correct CV axle angle and allowing for the use of the stock front driveshaft. Also included for the front are replacement tie rod ends, longer sway bar links, front heavy duty skid plate, brake line brackets, and FOX factory series 2.5 coilovers with DSC reservoirs. 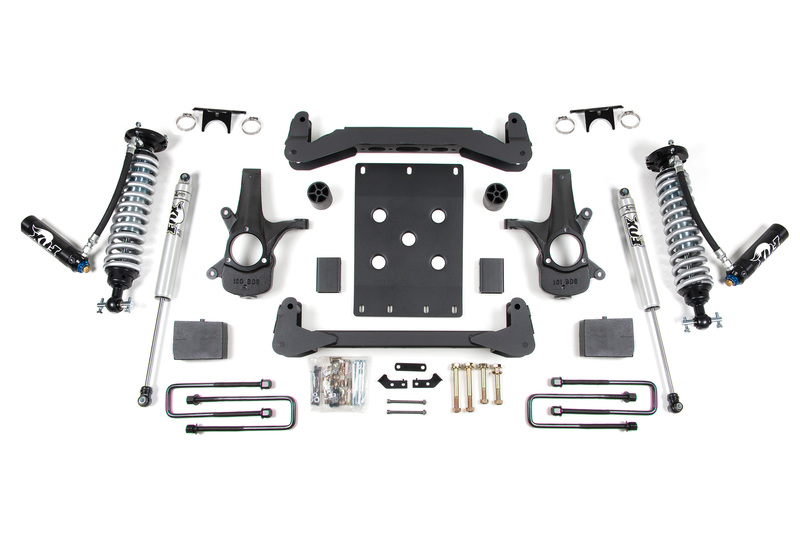 For the Chevy/GMC trucks, the rear of these 6" performance coilover systems is available your choice of cast iron lift block + add-a-leaf or upgrade to the GlideRide leaf springs. New black e-coated u-bolts and FOX 2.0 IFP gas performance series shocks round out this kit allowing for 35" tires to be installed. For Chevy/GMC SUVs, BDS uses a 5" ProRide coil spring to lift and level the stance. 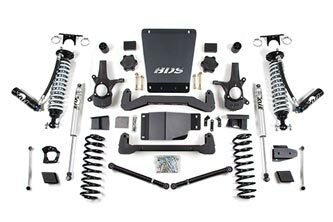 Also included are a pair of adjustable upper control arms to dial in the rear pinion angle, heavy duty rear track bar bracket, extended sway bar links, bump stop extensions and Fox 2.0 IFP gas performance series shocks. As with all BDS kits, these lift kits are backed by Factory Protection Plus Program, a comprehensive vehicle protection plan offering a 5 year – 60,000 mile drivetrain warranty, ESC System compatibility, and BDS’s exclusive No Fine Print Warranty. 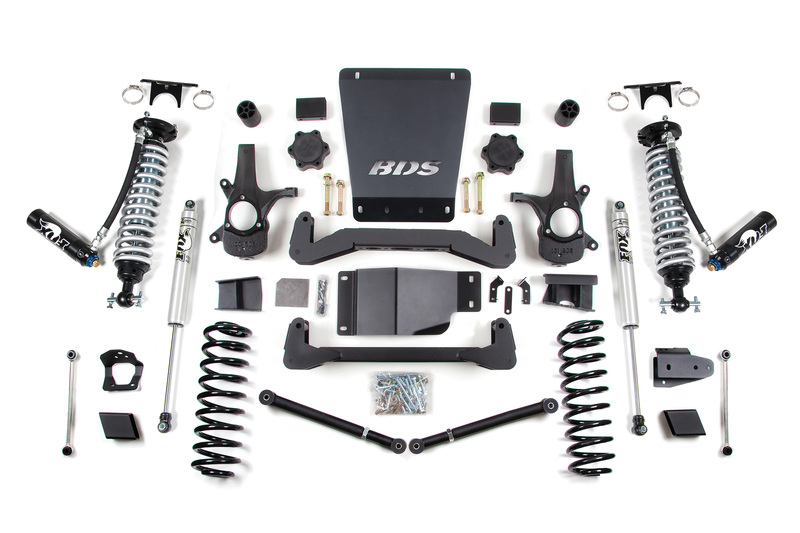 For more info on these new 6" DSC coilover systems head to BDS Suspension or call (517) 279-2135. Should I replace the upper and lower control arms on my 2018 Chevy 1500 with the 6” coilover system? Hey Rob, to answer your question there is no need to replacement UCA/LCA when installing the 6″ lift systems, our kits are designed to work with the factory arms. Aftermarket arms can offer additional suspension travel, the UCAs are most common. At this time, unfortunately we don’t offer replacement arms for your vehicle.